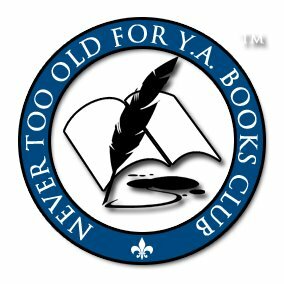 Welcome to Author Thursday sponsored by Never Too Old for YA and NA Books group on Goodreads. Today we continue our male author interview month and bring you Bradon Hale. Brandon is known for his totally awesome Vampire/Dystopian books! For ten years now, humanity has been at war with the creatures of darkness. The war has changed the world. The day now belongs to humanity and the night belongs to things once thought to exist only in myths and legends... but there is hope. This new enemy has united humanity and an army has stepped forward to protect the light from the darkness. An army of heroes. Eighteen year old Lily Baxter always knew the Day Soldiers would be a major part of her life. She had been preparing for it since she was eight. She was ready to go to war. The one thing she wasn't prepared for was the day the war came to her. Sometimes, the only way to get rid of an infestation is to light a fire. A purging fire. There are those who believe the rise of the vampire is nature’s own purging fire, set to rid the world of the infestation known as humanity. Since the Battle of New York a year ago, life has not been easy for the Day Soldiers. They have taken a beating. The creatures of darkness have declared victory and are working to build a new world where human beings are a food source and nothing more. Humanity is hurt, but not defeated. Led by Commander Geoff Wallace, the surviving soldiers have a plan in place to take the world back from the dead. Book Three in the Day Soldiers Trilogy. After more than a decade of fighting, the end has finally arrived. The war is almost over. 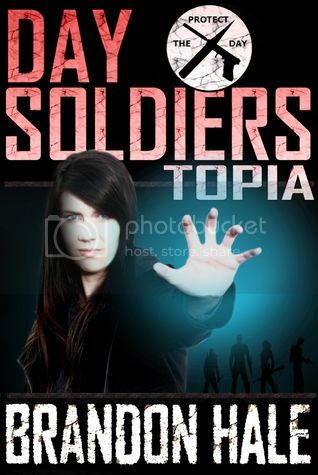 A few courageous Day Soldiers have chosen to make a final stand against a world of vampires. They know it’s a battle they’ll probably lose, but they made a promise to protect the day and it’s a promise they intend to keep. They fight because they are the Day Soldiers. They fight because nobody else can. They fight because, if they don’t, all hope is lost. They sound good, right? Let me tell you, these books will surprise you! The story surprised me! So let's hear what Brandon had to say to our questions! Did you always know you wanted to be a writer or did you want to be something else? I’ve always known I was a storyteller. Actual dreams of being an author probably started when I was about 12 years old. Like many authors, it really started because I couldn’t find the books I wanted to read or the movies I wanted to watch… so I just wrote my own. How long does it take you to write a book from start to finish? Usually, about three months, depending on how much time I devote to solid writing. An enormous amount of my time is taken up by marketing, which often eats up my writing time. How do you come up with themes for your stories? The themes to my stories usually just… evolve. More often than not, they develop from the characters in the story. I do my best to write realistic characters (even if they’re in unrealistic settings) and those characters almost always drive any over-arching themes in the novel. Do you have a schedule of when you write? I try to put in at least 5 hours of writing a day. Maybe it’s just the macabre settings of my stories, but I usually do my best work late at night. How are you able to balance other aspects of your life with your writing? It’s tough. With other jobs, you can just clock out. With writing, I’m always working. Writing is more than just a full time job… when you’re awake, you’re writing. It might be in your head, but it’s always happening. My wife keeps me balanced. Spending time with her is my reward for getting a certain amount of work done. It serves as a motivator and a break. What elements do you think make a great story line? Everything’s important, but for me, a great story is all about the characters. Everything I write is character-driven. If you have great characters, you can make a mediocre story great. If you have mediocre characters, you can ruin a potentially great story. The best example is Day Soldiers. The premise of Day Soldiers isn’t why people love it. Folks like those books because of the characters. Lily, Grung, Ellie, Scott, Abbie, Wallace, Dennis… those guys carry the story for me. They do the heavy lifting. I regularly get emails from readers who talk about how much they love certain characters. Those emails make this whole writing game worth it. What was the hardest thing about writing a book? Time. It’s not really about finding the time to write… it’s more about making the time to write. You have to make sacrifices. You have to choose to devote those hours to finishing the book. I can crank out a short story in one sitting, but a novel is work. Sure, it’s great work that I love, but it’s still work. If you don’t devote some real hours to completing a novel, that novel will never get done. How many books have you written so far? Do you have a favorite? I’ve written seven full length novels, but I only published four of them. The first three were written when I was very young (late teens/early twenties). They were great learning experiences, but I don’t feel they’re ready for prime time, so they’re permanently shelved. Aside from the novels, I’ve also written countless short stories. My favorite is probably Day Soldiers. Simply put, I like it because it’s fun. That’s the purpose of Day Soldiers. Good, simple fun. Don’t get me wrong, I like the deep stuff, but there’s just something about escaping into a great adventure that’s good for the soul. It’s my hope that Day Soldiers provides that. Do you have a favorite character? Travis, from Purging Fires (Day Soldiers, Book Two). Writing Travis was a blast because I was able to just… unleash. 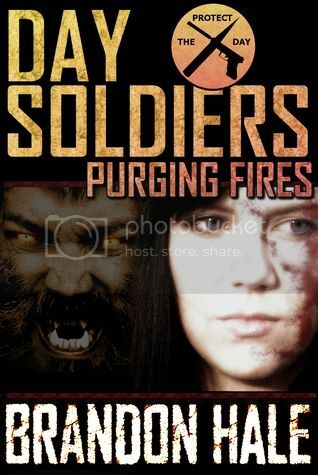 I won’t say more because I don’t want to spoil the story, but anyone who’s read Purging Fires will understand. Where do you write? We have an extra bedroom that we converted to an office. It’s my hideaway. When deciding on how to publish, what directed you to the route you took? It was a tough decision. I spent a good year doing the research and eventually settled on being an indie. Several years ago, it meant something very different. Today, it’s simply another path an author can take. The deciding factor was probably creative control. I completely respect the traditionally published authors, but in this digital age, there’s really no reason to give up creative control of the books you write. Have you gotten feedback from family about your book(s)? What do they think? I come from a family of readers, so they’re all incredibly supportive of my writing. I feel very blessed when it comes to my family. They don’t see this writing gig as a pipe dream. They see it as a dream job, and they’re very proud to have an author in the family. Day to day, spending time with my wife is my favorite activity. Whether it’s playing games or watching movies, as long as she’s with me, it’s a great time. What kinds of advice would you give to someone who wants to start writing? Finish something. I’m amazed at the amount of people who tell me they want to write but have never finished a story. You want to be a writer? Finish a story. One book. Stick to it until you’re done. The experience that comes from completing a novel will teach you more about the writing process than anything you could read or watch. Writer’s write. It’s that simple. What is your favorite book? favorite author? Do you have an author that inspired/inspires you to write? That’s tough. I love most horror authors and I enjoy classic pulp fiction. I like Stephen King’s older stuff (Salem’s Lot, The Shining). I love Richard Matheson’s I Am Legend. Great book. I’m also a huge fan of Bram Stoker’s Dracula and Mary Shelley’s Frankenstein. I love Tolkien’s books and I’m a big fan of Robert E. Howard’s Conan stuff. All of these authors (and many, many more) inspired me to write. Do you have any go to people when writing a book that help you with your story lines as well as editing, beta reading and such? I have a circle that begins and ends with my wife. I have several folks who work together to give me feedback and editing. They’re my beta readers and they’re great at it. The first Day Soldiers was actually dedicated to them. But my wife is always the first person to read a draft and she’s always the last person to read the final copy before it goes live. Thanks so much for stopping by today, Brandon! It's been great having you here and hearing about your process! DAY SOLDIER IS CURRENTLY FREE FOR KINDLE ON AMAZON! GO PICK IT UP! Brandon Hale grew up in a small Virginia town. It was in that town that he met his first love: Horror books and movies. He wrote his first full length novel when he was 17. In the decades since, he has written nonstop, producing multiple novels and short stories. Brandon's first published novel was The Gods and the Builders. Shortly after that, his second novel - Day Soldiers - was released. 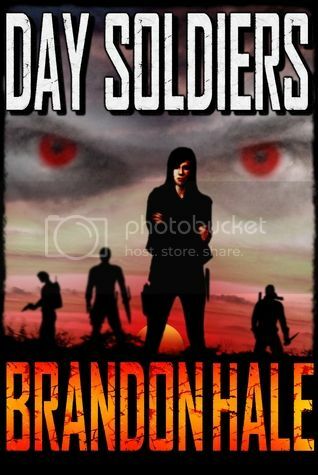 Brandon is currently finishing up the second book in the Day Soldiers trilogy (which should be released in late June). The third Day Soldiers book is expected to be released by late August. Brandon still lives in Virginia with his wife Laura. Enjoy, Julie! I really liked it. Very different. Dystopian/paranormal!